A Card that is Locked is flipped face-down and cannot do anything or have anything done to it. But it turns back up at the end of its owner’s turn! If you bind your opponent’s Units, they won’t be able to fully Boost or Attack during their next turn! A Locked Card seals that Circle and is no longer considered a Unit! They cannot pay the cost of an ability! Or removed! You can’t even retreat it by calling another Unit on top of it! It’s a brutal ability no one can escape. Q: Can a Unit that is Locked get retired by any means (Replacing them or by Card Effect) ? A: No. When the unit is locked, it cannot be a target of any card effects or be replaced by other units. You cannot do anything to Locked units until they are lifted from Lock. Q: If I have a « Liberator » Rearguards that is locked by my opponent, will « Liberator of Round Table, Alfred » still gains the additional Power Boost, via Limit Break, from the Locked Unit. A: Nope. As the unit is locked, it is treated as « Non-Existent ». Thus Alfred will not get the additional Power +2000 from the Locked Unit. Q: If I have a Red River Dragoon on the field and is locked by my opponent, will my « Liberator of Round Table, Alfred » still have the restriction of Lord Ability? Q: When a unit is removed from the Lock ability, will « When this unit appears on the Vanguard or Rearguard » related skills be triggered as they are returned to the field? A: Nope. As it does not appear on the Vanguard or Rearguard Circle, but is flipped over, it will not trigger the related skill. Q: Can Locked Cards be a target card to switch with another unit in the same column? A: As the Rearguard Circle that is locked with the card is treated as non-existent, you cannot switch a card that is not affected by Lock with the Locked card in the same column. « With effect from the 11th of May 2013, for the Japanese version of Cardfight!! 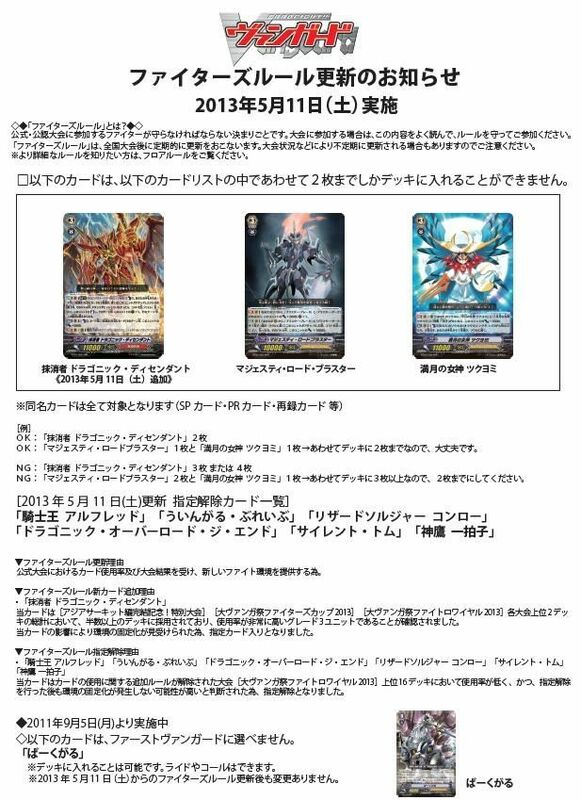 Vanguard, the cards highlighted in the following list will be restricted to up to a total of two cards in the deck (including the first vanguard). [BANLIST] La Banlist de Janvier 2013, la première banlist réelle. Voir la suite de [BANLIST] La Banlist de Janvier 2013, la première banlist réelle.